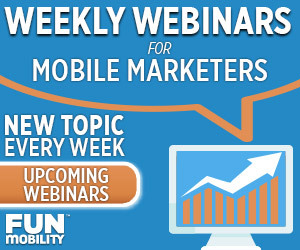 Join FunMobility for a free Webinar exploring the innovative technology of AppWidgets. AppWidgets provide a unique and agile solution to the cost and resource requirements that marketers struggle with today in the mobile space. Businesses of all types, from retailers to publishers, can benefit from the way AppWidgets allow marketers to focus on brand message, customer experience and audience insights. Join us on March 27th at 11:00 AM Pacific as we introduce FunMobility AppWidgets. Explore how AppWidgets enable mobile success and empower customer acquisition, engagement, retention and monetization through the mobile channel. Hudson George, VP of User Experience at FunMobility, will speak about this creative new toolbox for building mobile applications. He’ll discuss the anatomy of AppWidgets, including branding and customization, behavioral data collection and using it all to create engaging mobile experiences. Get guidance on how choosing a variety of different AppWidgets can help build an app that spans the entire customer lifecycle.